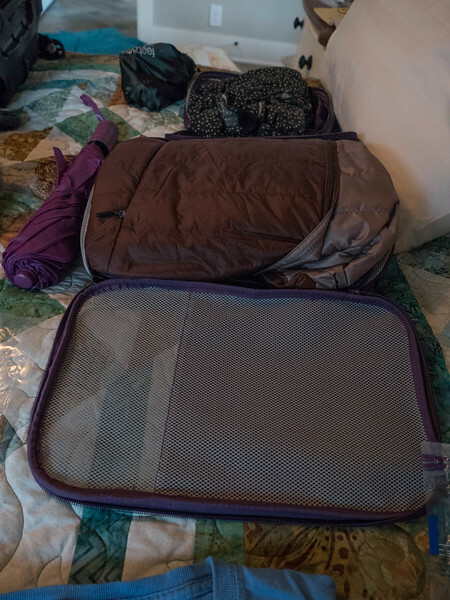 I am not leaving till later in the month, but when I posted on facebook about managing to pack it all into just a carry-on, I got requests for how I did it and what I packed. I decided a blog post was the best way to handle that. First, I have to say that I have to thank Erin and Mui from Two to Travel for all their wonderful insights about traveling, for web links and suggestions, and general encouragement. In the past, when I have traveled overseas, either with Mo or with my daughters, it has been with a tour group. 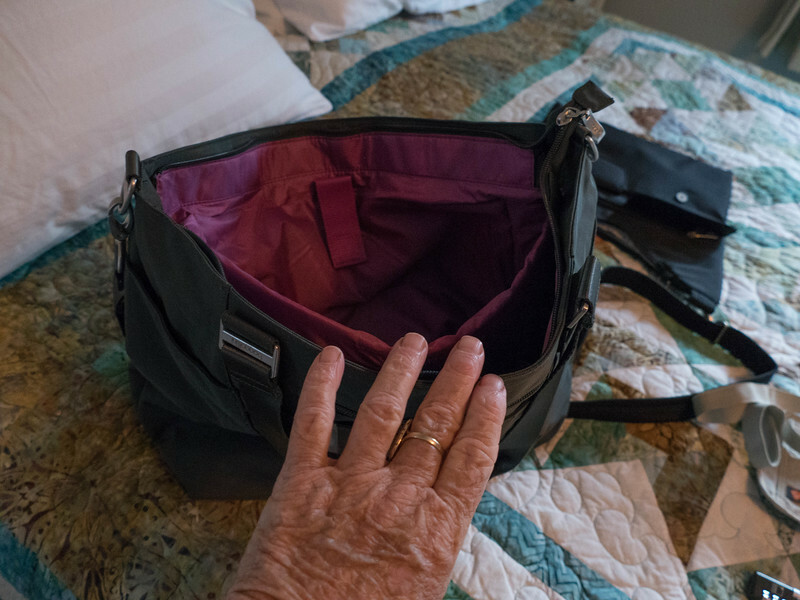 Lots of good things to say about that method of travel if you want to see a LOT of stuff with help with all the details, including shlepping around the baggage and getting it into the hotels and back out again. This trip, however, is with daughter Deanna, who prefers a more relaxing vacation, one where we stay in one place for a week or two. 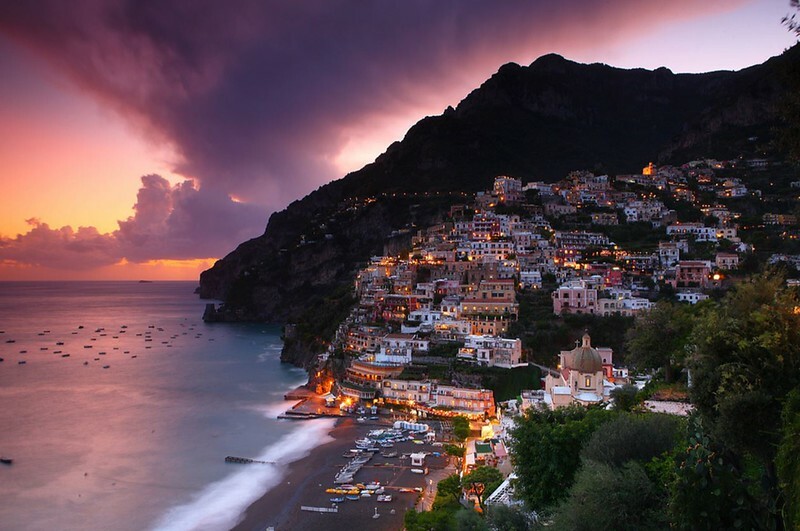 We have chosen to stay a week in Positano on the Amalfi Coast toward the end of September, and for two weeks in Florence during the first two weeks of October. 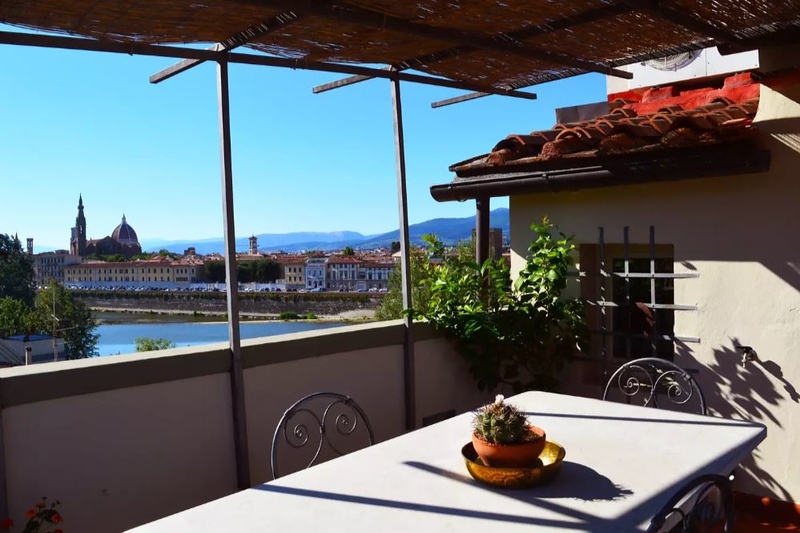 We found reasonable air fares after a few kerfuffles with already paid for Air Canada flights out of Vancouver, cancelled and converted to Lufthansa flights from Seattle, through Frankfurt, and on to Naples. 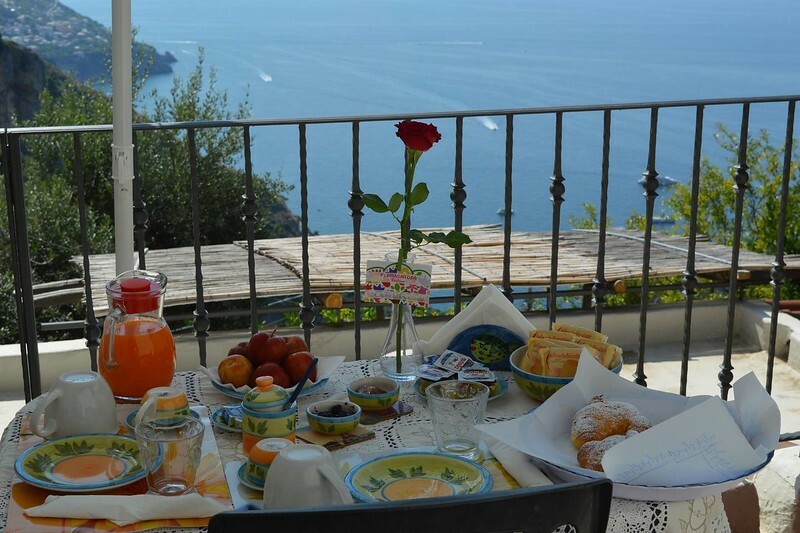 Deanna and I settled on two Air BandB apartments, and transportation from the Naples airport to the Amalfi Coast and then returning to the train station in Naples a week later by the owner of the Positano BandB for a reasonable fee of 100 Euro each way. Thanks to Erin, I used The Man in Seat 61 website to book the fast train from Naples to Florence for our two week stay when we leave Positano. We paid just a bit more for business class seats on the train. We will be in Italy during shoulder season, but a time still quite popular in Italy because the heat has dissipated some but the really bad weather will not have yet begun. The weather, of course, makes for some complex packing. Warm enough for chilly rain, cool enough for 8o degree possibly humid days. Dressy enough for some fine entertainment in Florence, and comfy enough for hiking the Amalfi Coast. I went to a packing class held recently at our local AAA office, by Anne McAlpin, “packing guru”. The class was fun, and I was surprised that even in our small town there were more than 100 people in attendance. I learned a couple of things, got some handy hints, but most of all it was about selling lightweight and useful travel items. I rolled my eyes at the sales pitches, but found myself purchasing a few goodies in spite of myself. So, for those who wanted the detailed run-down, here it is. 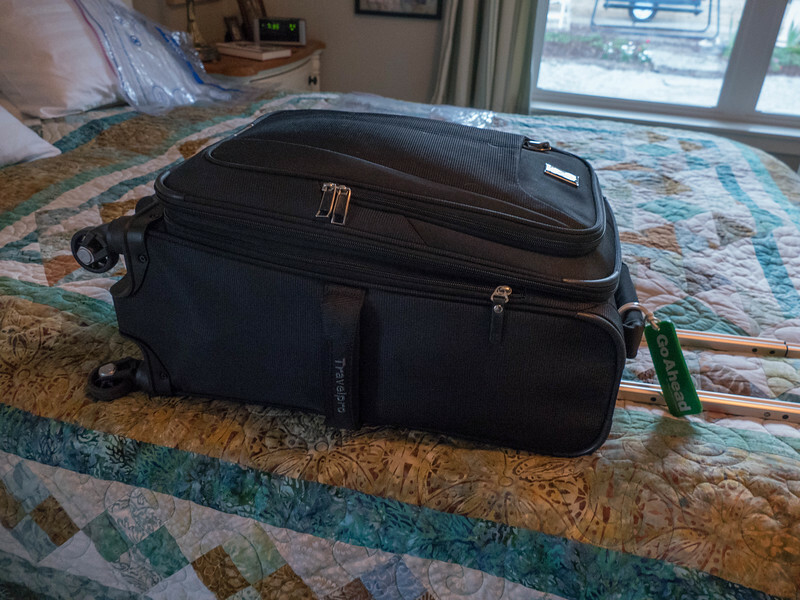 My Carry-On weighs 4.2 pounds, and has spinner wheels on the bottom. I managed to get all of this packed into it. At first I used those ziplock packing bags, but discovered that they didn’t really change the volume as much as I expected, and kept stuff from slipping nicely into crevices. So I skipped them entirely, but I did use a couple of lightweight compression cubes, and am a fan. Anne said something about 3 bottoms and 9 tops, and I have no idea what my ration is, but here is the list. First, choosing what to wear on the airplane is interesting. I wanted something comfy, nice looking, relaxed, layered for fluctuation temperatures, and of course, the heaviest shoes, so this is what I chose. The jeans are my most comfortable and best fitting, but I hate that they don’t have pockets. The shoes are surprisingly lightweight, and are my choice over my Keen hiking boots, which might still end up being the final choice. 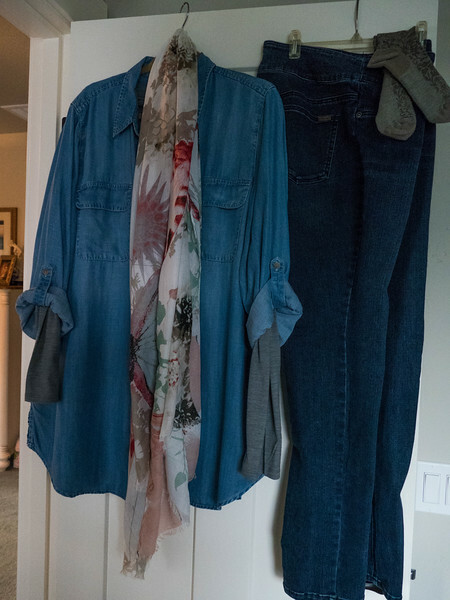 This same outfit will serve me well throughout the trip, I think, with the shirt being wrinkle free tencel and the scarf dressing it up when needed, and the lightweight long sleeved tee from REI serving as a warmth layer if needed later. Oh yes, one pair of those ridiculously expensive compression socks for flying, and maybe for hiking as well. I found one of those killer down puffy jackets from REI, on sale 50 bucks! Much less than the 300 Patagonia version and it fits better than they did as well. A packing cube holds the down jacket and my packable black raincoat/trench. I packed a travel umbrella, and waterproofed the red shoes. Another cube holds my nightgown, undies, bras, and power converters. Not too many of the undies since I am capable of washing them. For our nice dressy event at "The Three Tenors”, I have a travel knit purple tank, matching cover-up and black skirt. 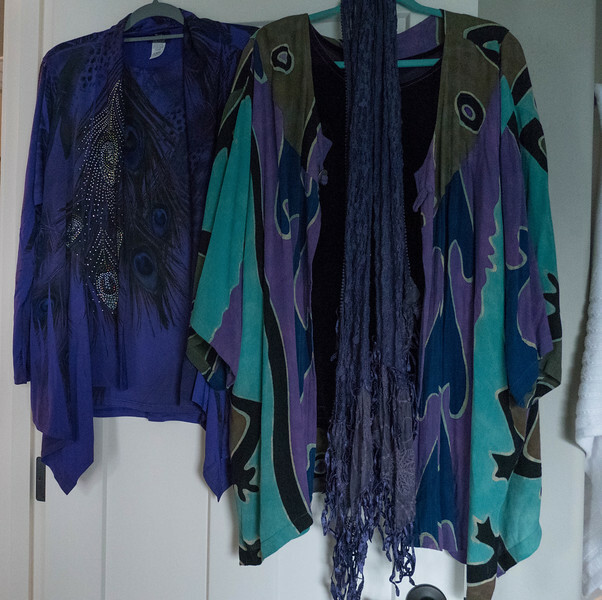 For moderately nice dressing, I also have a rayon arty cover up to wear with the black tights or the black skirt. I can dress up just about anything from jeans to the skirt with the spiffy stretchy black blazer jacket, and a wrinkle free white shirt. 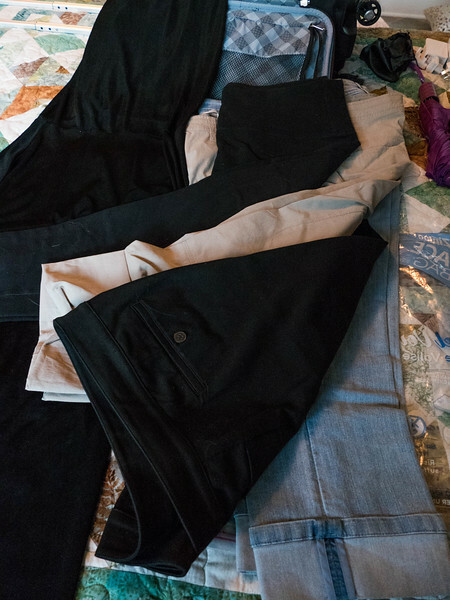 For pants I have a pair of lightweight REI hiking/travel pants that will roll up, a pair of super comfy light denim capris, a pair of dressy black capris, and black tights. I threw in a funky pair of black shorts and a black cotton lightweight shirt for hanging at home on a hot afternoon, and had to throw in a tee shirt just because. Then just because I could, I also threw in another lightweight print top that can be worn cool and sleeveless (not to the churches!) or dressed up with the black jacket. 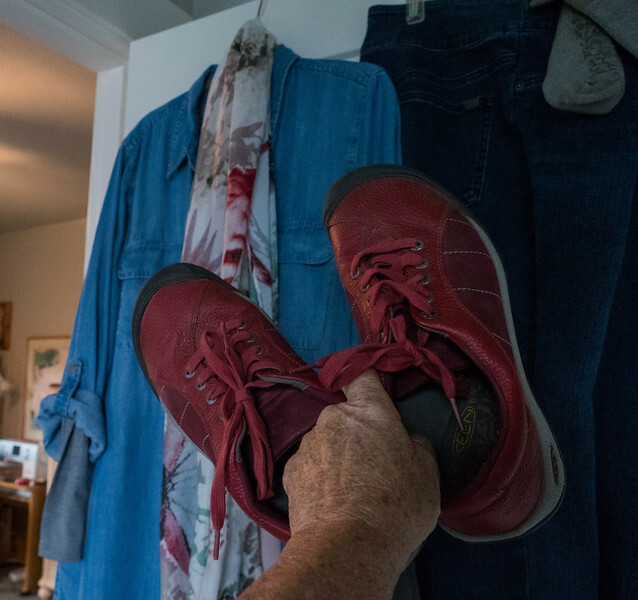 For shoes I have the red Keens, a pair of Taos very lightweight, very supportive denim sneakers that don’t look like running shoes. No photo yet of those. I had a problem coming up with shoes that would look nice with the skirt, and finally settled on a lightweight pair of flat sandals. Might be a bit weird, and not very Italian (they wear stillettos everywhere I think) but most of my dressy shoes have heels that I don’t want to have to wear walking from our apartment to the bridge. I also packed my very casual but incredibly comfortable black oofos for walking just about everywhere, even on cobblestones. 4 pairs of shoes, dressy sandals, funky sandals, red walking shoes, blue sneakers. The one thing that could throw this whole thing out of whack is the need for some kind of more waterproof shoe, like my hiking boots, so I am not sure how that is going to work, but I’ll check again with the weather as the trip gets closer. Then again, wet sneakers wouldn’t be the end of the world. Now for the “Personal Item”, which will actually be two, but the small cross body purse will fit inside the Baggalini tote for boarding the plane. In the purse will be my passport, ID, a small amount of US currency and a small amount of euros, for tips, food and such, and a credit card. The phone and a mophie charger, charging cord, and pen. In the tote will be the laptop, laptop power cord, and a small a small cube containing my medications (not many), phone charger, extra batteries and charger for the Lumix camera (carried by Daughter Deanna) new nifty fast inflating neck pillow, ear buds, and inflatable seat pillow. I am hoping that my larger scarf will serve as a bit of a cover up while flying. 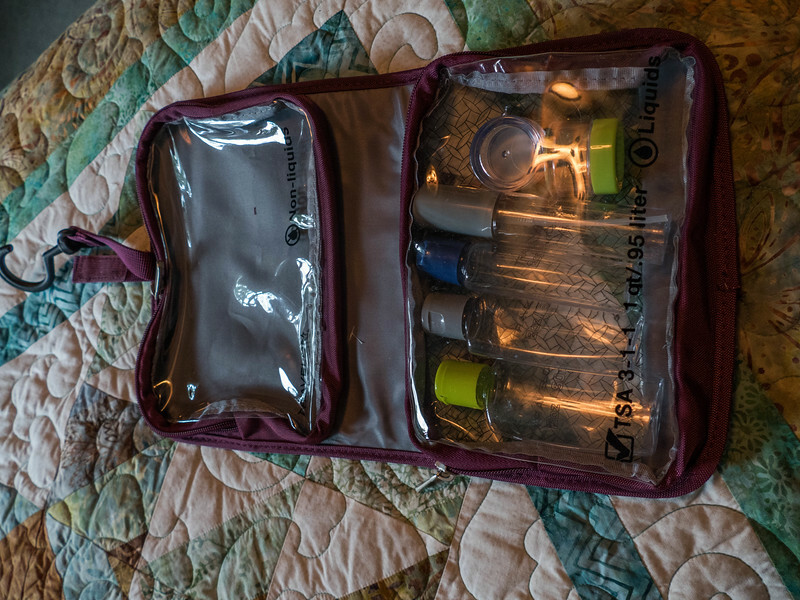 In another nifty little purchase is a TSA allowable packing cube (beats a ziplock, really) for the liquids on one side and dry food snacks on the other side, now required to be pulled out for security checks. I’ll have an empty water bottle ready to fill after going through security. I won’t be taking a lot of toiletries, since I would imagine that there are some nice fun goodies that will be easily available in Italy. Finally, around my waist, will be the RFID blocking money belt which with a bunch of Euros (already purchased through AAA), my medical insurance card (even though I will most likely have to pay and then get reimbursed) an additional credit card, and a debit card, all reported to the companies for traveling, and two of them with no foreign transaction fees. The debit card will have fees if I need more cash, but at least that will be a good exchange and I can get cash if I need it. One last little tidbit of information learned at the class: I always thought making photocopies of your cards and passports was a good idea. Instead, she said to photograph them and then email the photos to yourself. Instantly available if you have internet access. Verizon phone will be basically off, but I’ll pay the minimum International charge for emergencies, will download google maps of Florence and the Amalfi Coast for use offline, and have downloaded Google Translate in Italian for offline use. I will also have printed receipts for the pre booked train tickets, pre paid museum tours, and our Three Tenors night in Florence. Planning this trip has been really fun for me actually, minus a few stressful glitch moments. Much easier actually than trying to plan 3 months going to Florida next winter. Geez, what a pain! 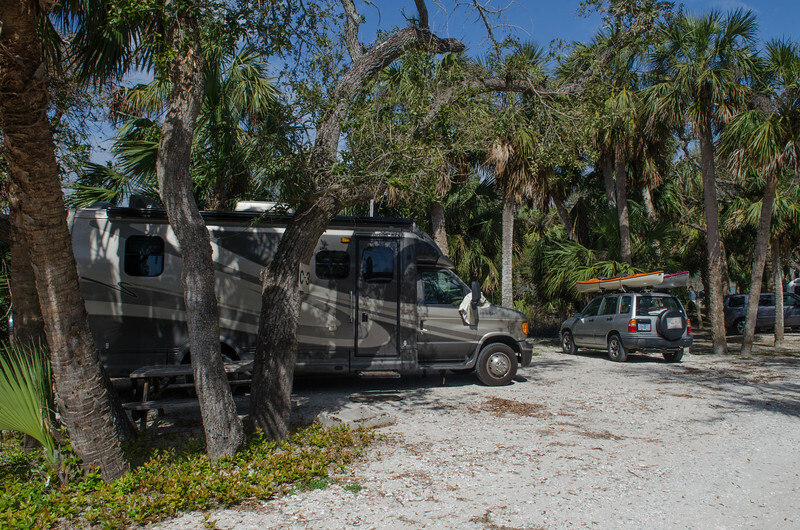 I was on the phone for 90 minutes last week on the first moment when the Family Camps near Jacksonville came open for our window of reservations. Somehow we got lucky, and got what we needed, but that is another story.